Here’s a new entry in our Short Cuts series of Pathfinder-compatible PDFs. These are tightly-focused PDF products that look at a single topic relevant to the Pathfinder Roleplaying Game. All Short Cuts are appropriate for use with Freeport: The City of Adventure, but can also be easily used in any Pathfinder RPG-compatible campaign setting. 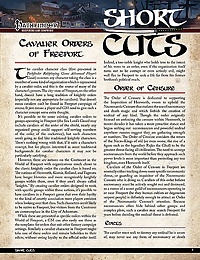 Short Cuts: Cavalier Orders of Freeport is a 6-page pdf that presents five new cavalier orders as found in the World of Freeport, but appropriate for use in any Pathfinder Roleplaying Game-compatible campaign setting. Each order presents its own edicts, challenge, skills, and abilities. Get the Pathfinder Short Cuts: Cavalier Orders of Freeport PDF today for just $2.95!